Our recipe for roasted butternut squash and chickpea soup is perfect for a rainy bank holiday (like today) or equally as a warming meal as the days start to become colder. The butternut squash is just starting to come into season in the UK, which means an abundant supply should be just around the corner. This vegetable can be a little messy to deal with i.e. removing the fibrous parts around the seeds, which although edible themselves aren’t the main attraction. The few minutes’ effort required to prepare a squash is always a good investment, as this versatile vegetable can be used in pasta dishes, risottos, soups, curries and more. It is high in Vitamin A and C and a good source of beta-carotene (hence the colour). 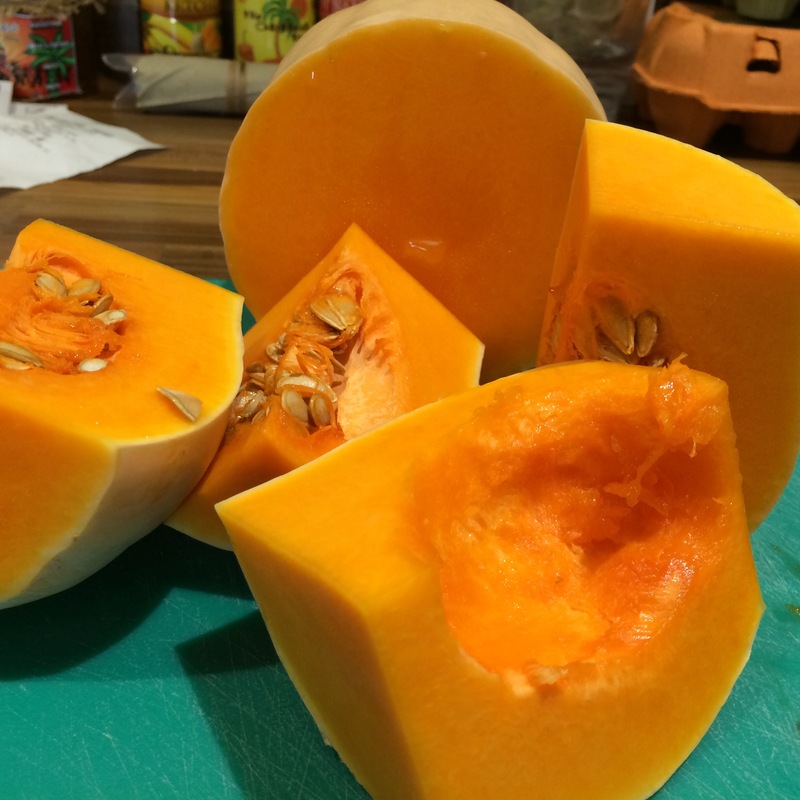 In the Season’s Eatings’ kitchen, we never bother skinning squashes, as this is a bit too much preparation, besides the skin softens down and is very edible after the cooking process. We start by roasting the butternut squash in this recipe, then heating through with the other ingredients before blitzing into a soup, so have you your hand blender at the ready. 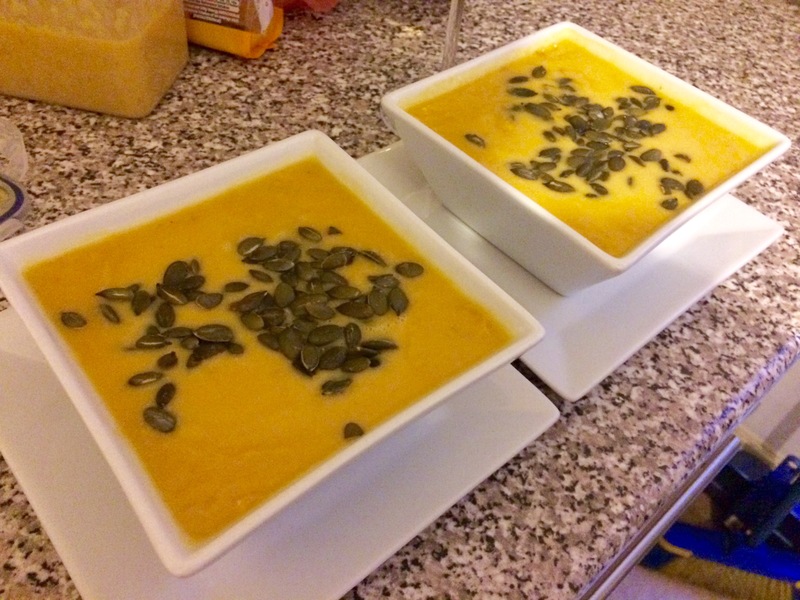 We served our soup with pumpkin seeds, which we lightly toasted for a couple of minutes and thick slices of ciabatta. 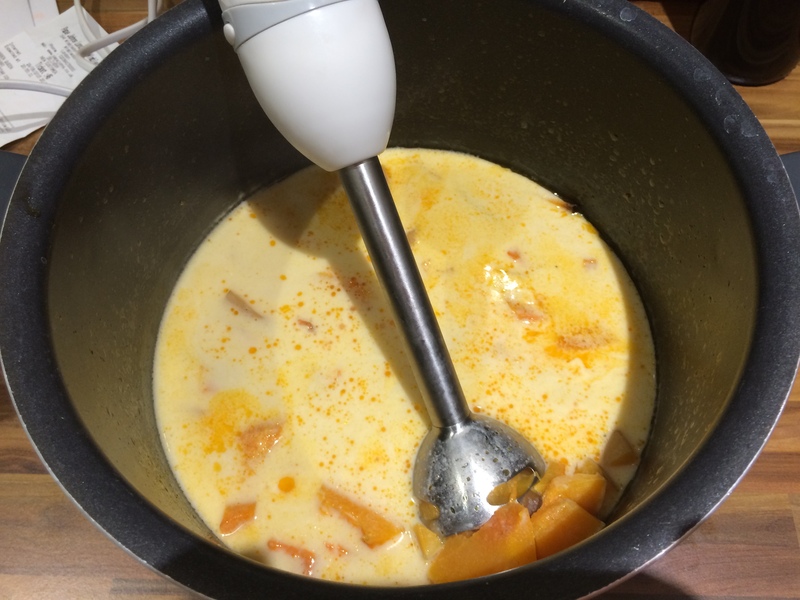 We used normal coconut milk, meaning the flavour was very rich, although if you want an even healthier option, use reduced fat coconut milk. The recipe makes plenty for 2 people and some left over (for lunch the next day perhaps), so as usual with our recipes, have some Tupperware to hand. 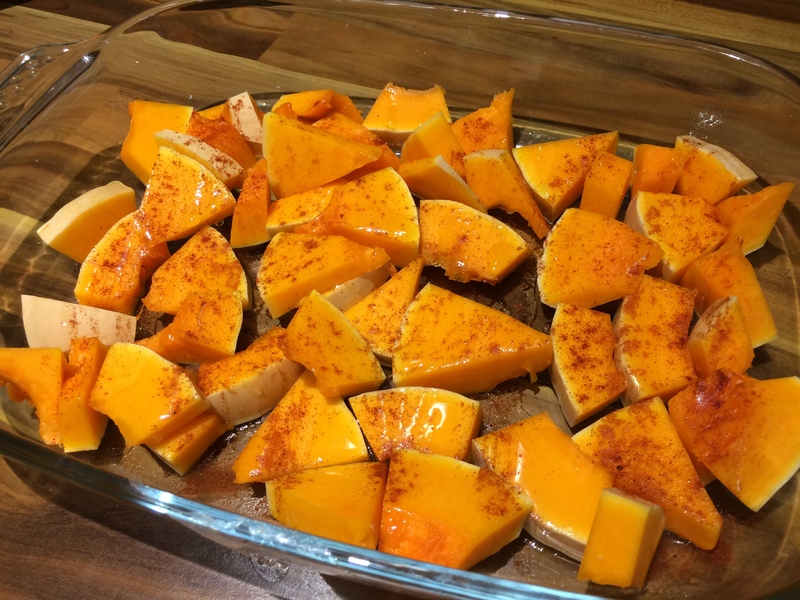 Tip the chopped butternut squash onto a roasting tray. Drizzle with olive oil, sprinkle with the smoked paprika and a little salt. Put in the oven and cook for 25 minutes. Meanwhile drain and rinse the chickpeas and add to a large saucepan with the vegetable stock and coconut milk. Five minutes before you remove the squash from the oven, start to bring the saucepan of chickpeas and liquid to the boil. Remove the butternut squash and add to the saucepan. Allow this to simmer for 5 minutes then remove from the heat and blitz with a stick blender until smooth. Toast the pumpkin seeds in a small saucepan over a medium heat for a couple of minutes – no oil is required. Serve the soup with a sprinkling of the toasted seeds, a twist of freshly ground black pepper and a drizzle of olive oil.